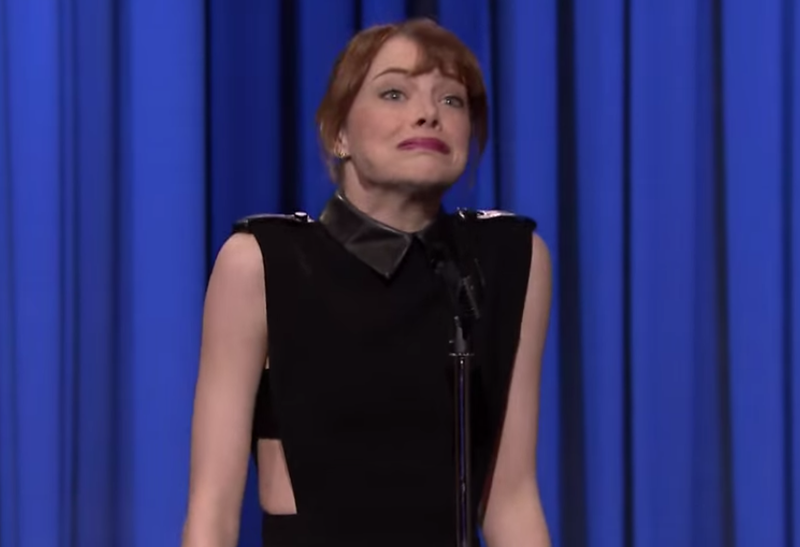 Emma Stone was recently on The Tonight Show Starring Jimmy Fallon. She was there promoting her most recent film - "The Amazing Spider Man 2". However Emma's Lip Sync Battle with Jimmy was the true highlight of the night - and video of this performance went viral. Jimmy songs were Iggy Azalea's "Fancy" and Styx's "Mr. Roboto". Emma's countered with "Hook" by Blues Traveler and her second was "All I Do is Win" by DJ Khaled. Emma won hands down. A very interesting couple of nonverbal signals were seen right after Emma finished "All I Do is Win". Up until then she was "in character". As a skilled actor who uses the Stanislavski method, once she finished and slipped back into her own persona - Ms. Stone first displayed the "Social Etiquette Fear Face". The social etiquette fear face is a lower level of fear manifested in the mouth and neck (note tightening and retraction of lips - down and with corners pulled back as well as a distinct tightening of Emma's neck muscles) - but not in the eyes. Here it is a form of self-deprecating behavior - essentially saying "I went a bit wild there - didn't I?" The lack of eye findings thus connotes significantly less fear. The social etiquette fear face exampled here lasts for about a half second - or perhaps a bit longer - thus it is a microexpression or slightly longer. But this expression may certainly last longer. If the fear had been true fear, the eyelids would open widely. With social etiquette fear face, the eyelids commonly have a component of a suppressed smile - and given the context this is very expected. A few seconds later, Stone displays a lateral Tongue Jut. The tongue jut (aka "Lizard Tongue" is of very short duration and is also and example of a microexpression. The tongue jut may have different meanings depending on the other body language signals which is simultaneous with (or nearly so). These include: "I got away with something", "I've done a foolish thing", "I've been bad" or "I just got caught". It can also be self-deprecation or a sign of extreme excitement. Which of these emotional-thoughts apply in this moment?